My dad was the best coach I ever had. Well, like most of us in the "dad game,” he had his ups and downs. Dad was a hard worker and good provider for the family. He would've done anything for his kids, and put countless miles on a series of beat-up vehicles watching us play everything from hockey to baseball to volleyball. But dad was often difficult to reach emotionally – raised in a different era when "men just didn't talk about certain things.” Meanwhile, in another by-product of yesteryear, my mom and dad got married much too young. They soon realized they actually didn't have all that much in common which led to a lot of conflict in our home –something very challenging for children to grow up with. Fortunately, sports provided an excellent escape and it was a world in which my dad really shone. Baseball was his first love, but hockey was also a big part of his life. In the late 1960's, he served as general manager of the Shaunavon Badgers, a Jr. B hockey team in Saskatchewan. At training camp one year, a pint-sized centreman from nearby Val Marie, Saskatchewan arrived on the scene hoping to crack the Badgers line-up. It was obvious the kid was talented, with a tremendous mind for the game. But he was also really small and, at age 14, a little young to be lining up against some of the big thugs that inhabited junior hockey back in the "good ol' days.” With those stumbling blocks in mind, dad had the job of informing the teary-eyed kid from Val Marie that he wasn't ready to play for the Badgers. Bryan Trottier – a seven-time Stanley Cup champion and member of the Hockey Hall of Fame. 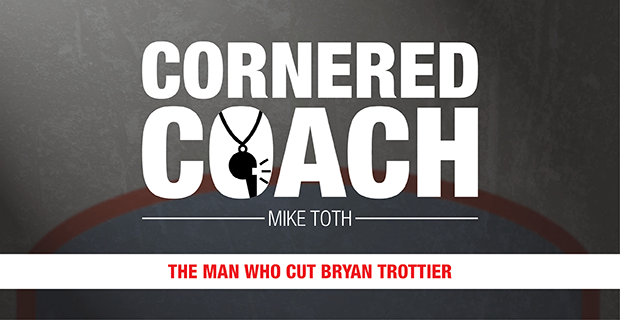 As the years rolled by, we'd often tease dad about his own personal hockey claim to fame: The only man alive who cut Bryan Trottier. In the end, it actually turned out to be a positive. Trottier went back to play Midget hockey after being chopped by the Badgers, and ended up winning a provincial championship. Trottier's linemate in Midget hockey, by the way, was current Vancouver Canucks head coach Willie Desjardins. A few years ago dad chatted with Trottier, who was suiting up in an old-timer's game, and Bryan told dad that, yes, getting cut was the best thing that happened to him because he wasn't physically ready to play junior hockey at that time. Interestingly enough, dad was able to document the Midget run by Trottier and Desjardins. Dad, you see, was a small-town radio broadcaster and provided the play-by-play description of the Saskatchewan Midget playdowns. Through the years, we'd often pull out the old reel-to-reel tapes of those long-ago contests and it was always thrilling to hear dad's voice detailing the "Trottier to Desjardins" killer combination. As the years rolled by, I was lucky enough to be coached by my dad. At the core of his coaching philosophy was the belief that everyone on the team is important and it's the coach's job to put the athlete in a place that will allow them to succeed. In Little League baseball, for instance, we had a big kid named Ronnie Chizik who could hit the cover off the ball but couldn't catch it if his life depended on it. Dad's solution was beautiful in its simplicity. Needing to keep big Ronnie's big bat in the line-up, in the days before the DH, dad tossed him a first baseman's mitt and relayed a set of specific instructions. "It's okay if you can't catch the ball, Ronnie," explained dad. "Just knock it down and pick it up!" It worked like a charm, and I can still see Ronnie's grinning face as he'd knock the ball down and then pick it up with his bare hand, looking like a little kid on the beach discovering an especially brilliant seashell. A few weeks ago, dad passed away. (Old Ronnie Chizik, by the way, was at the funeral.) Dad had been sick for a long time and was ready to go. Still, it's never easy saying goodbye to someone you love. Like all of us, there were many sides to my dad and he didn't always get it right. He cut a Hall-of-Famer, for crying out loud! But his heart was always in the right place. The heart of a devoted father, a longtime sports fan and a talented coach. The best coach I ever had.